Krshmir is a city of undead, untouched for a generation. It was long walled off by survivors, and lies up in the mountains, a festering sore upon The Cradle. The party listened to Corvus, hired horses, and rode up the lonely mountain trail to Krshmir. They reach Krshmir and find the gates closed, and the city overrun with zombies and ghouls. They scale the wall, drop down on the other side. They sneak and fight their way east through the town, find a lost Bag of Holding along the way. They also find the Temple of Embra, surrounded by a a moat of acid. They head back outside the city walls to bury some treasure next to their horses, and also plant the sapling which they still carry. I regret that my studies have brought doom upon the world. For we, myself and Lord Krshmir have found the Divine Cube, one of four. I fear that the power I have wrought will have torn a hole in the world, and I fear for the demons that shall emerge from this gaping wound. I have seen the Black Heart of the Evil Gods and know that the worst is yet to come. The prophecy spoke of great power, but I was foolish in thinking I could wield such power. If you read this note, then please pray that you are virtuous. This stone, in the wrong hands, will end the world. Back safely in town, the party sets up shop at the Inn. Just when the flagons of ale are poured, a pair of guards rush into the inn, panting. "A .. a ... thing is attacking the city! Just come see!" A giant, Spider Lady Demon Thing is heading for the inn. The Demon that the Evil Druid was summoning? A crowd gathers as they fight on and finally defeat the spider queen. The party stands around, looking for clues on the spider queen while Gunderson, the town Cleric approachs them for help. "The light in the Tombs of Ashvin has gone out and now the dead are rising!" Sigh, can we at least eat dinner first? The party seeks the wisdom of Corvus the Black, who sent them on their first quest (and who they have not spoken to since). They explain everything that had happened (including the curse on D'Understanding), and he asks them to seek the council of Torus Whitetail, the Archdruid who lives in the Sacred Woods outside of Parthen City, about a week's journey southwest. Not only is Torus one of the few who can break D’understanding’s curse, but if druids are involved in demon summoning, perhaps Torus can help bring the druids back in line. He also believes that Turbo may have taken up residence in an Old Castle south of Ashvin. He sent another party of adventurers (what? another party?) to seek intelligence of Turbo’s whereabouts, but they were ambushed by goblins and ogres. All but one were slain. Barlo the Brave, the cleric of that party, is the only survivor. He begs for a chance to avenge their deaths and to kill Turbo himself. The party enters the keep, and find it crawling with Kobold guards. They manage to fight through several of the kobolds, leaving the evidence of their intent strewn about the dungeon. But, in their lust for treasure, they get distracted and find themselves in a room with Zombies. D’understanding, the druid, dies in the ensuing fight. The party retreats back to town. They do manage to find very fine priests vestments and a holy symbol for their trouble. Back in Ashvin, they meet Gunderson Oakenstaff, the high priest at Ashvin, at the Temple of the Divine Mother. He is watching over the Dwarf Child. He agrees to revive D’understanding in exchange for 500 gold and the holy vestments and symbol. The raising takes 3 days. After D’understanding is back to life, they head back to Turbo’s Keep, but find it now taken over by wolves, feasting on the entrails of Kobolds. They fight their way deep into the Keep and find Turbo’s lair, but he is not there. Instead of a sealed envelope bearing the seal of the Black Raven’s Guild. The open the envelope but find the parchment is blank. They decide to head back to town to confer with Corvus. 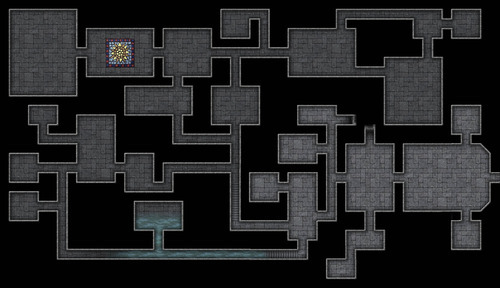 Here is the dungeon map I used in Roll20. 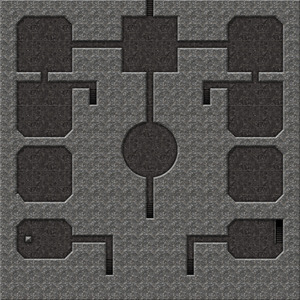 Feel free to use it for your own game! They rest well that night, holding onto the Black Mage's guild key. The next morning, they head to the Black Raven’s Guild to inquire about the boy. The gothic manse set beside a graveyard looks like an ominous site on such a warm spring day, but they enter the iron gates and approach the door. The door, flanked by carved statues of demons heads, has a large iron knocker. Toggaf, the magic user, reaches out to grab the iron kocker, but the door flies open on its own. They cautiously enter the foyer of the house, but as soon as they do, they find their bodies pulled through the fabric of space. They open their eyes, and find themselves sitting in a giant bird cage. They are greeted by a kind but cold magic user, who warns them that Corvus the Black does not tolerate tresspassing. A slender wizard with a slick of black hair and a sharp black beard enters with alarming slowness and precision. He walks with purpose and never breaks eye contact with Corvus as he enters. His furrowed brow does not deceive his annoyance as he asks, "who gave you that key?" The party explain the previous night's adventure and how they found the key on a young wizard who was trying to murder a young dwarf boy. Corvus the Black ponders this information. He weighs his words very careful, and explains, "As you can see, our guild is light on members. Several months ago, we had a defection in a wizard named Turbo. He left and took several apprentices with him. My first impression was that you were working for Turbo, but I see you have been swept up accidentally into his schemes. Turbo had cockamamie ideas about a prophecy and a 'divine cube.' I am light on resources but you seem ready for the task. Bring me turbo or proof of his death and I shall forgive your trespassing. I know where he is, and can take you there." Corvus then teleports the party to a location a few miles from Ashvin, up into the Spider Hills. There, they see an old keep.